When you think of all time greats in baseball, names like Babe Ruth, Hank Aaron, Lou Gehrig and Reggie Jackson are a few of the players that might pop into your head. When you think of Major League Baseball record holders you might think of Nolan Ryan, Cal Ripken Jr and Barry Bonds. Fernando Tatis would be the last player you would think of being one of the greats of the game or even holding a MLB record. While he is not a legendary player he does hold a pretty incredible record. Only thirteen players in the history of MLB have hit two grand slams in the same game. Fernando Tatis is one of those players to accomplish this amazing feat, but he did it better than the twelve other players. 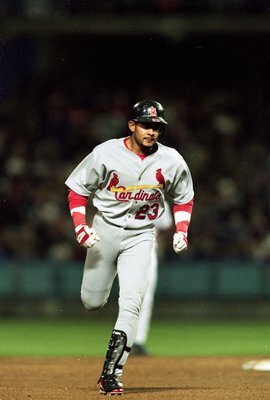 On April 23, 1999 Tatis, playing for the St Loius Cardinals took to the plate in the third inning of their game against the Los Angeles Dogders. Chan Ho Park was the pitcher on the mound for the Dodgers. Tatis hit not one but two grand slams, all of them in the third inning against Park. The Cardinals defeated the Dodgers by a score of 12-5 that day. Fernando Tatis retired from baseball after the 2010 season. He had a career batting average of .265 with 113 home runs and 448 RBIs. While not a impressive career numbers, Tatis holds a very rare and difficult record. Many look to records like Cal Ripken Jr’s consecutive game record and Nolan Ryan’s career no hitter’s as unbreakable records. This record is right up their with those as records that might stand forever. The proof is in the amount of player that have hit two grand slams in one game with only thirteen. Then take a look at how many did that in one inning, only one. While Fernando Tatis was a very forgettable player that had a forgettable career, no one can take away this accomplishment. So when you think of incredible records think of Tatis in that one game back in April of 1999.